This diary will be updated periodically throughout the year. [Early February] During the course of last season some amusement was caused by the design of part of the England kit. One spectator remarked to me that the shorts gave the impression the squad were wearing nappies. If I had any video of the team jog, the impression would be even stronger. 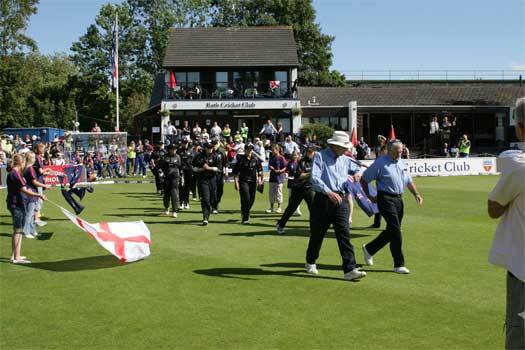 I had rather forgotten about this until some pictures recently appeared on the ECB web site of the latest England smart kit. I have no picture I can use here (the copyright is not mine!) but I was instantly reminded of Harry Hill, the doctor turned comedian, whose programme I have never seen but the advert for which it has been hard to avoid. [For those not familiar with this comedian his garb includes a shirt with an especially large collar]. [Mid-February] As I type England have taken an unassailable lead in the ODI series being 2-1 up with 1 to play. And all this has been accomplished in spite of the loss of the senior coach prior to their last victory in Sydney. It is a remarkable achievement taking on the world champions on their home soil and taking the first two matches off them in Australia since 1988. 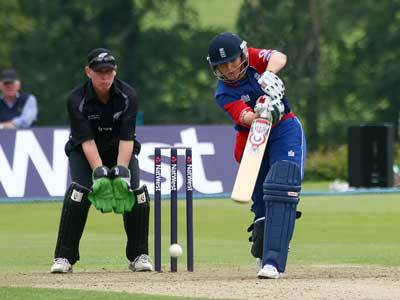 The captain Charlotte Edwards has reached a century milestone in ODIs. "Twenty20 is seen as the future of women's cricket, ..."
As you will know, if a regular reader, I have found much to agree with in Jenny Thompson's articles on the 'Net - not everything, of course, and the above phrase brought me up with a jolt. I notice the sentence is written in the passive, so I have no idea if Jenny holds this view herself, but I do hope it is not the view of cricket authorities around the world. 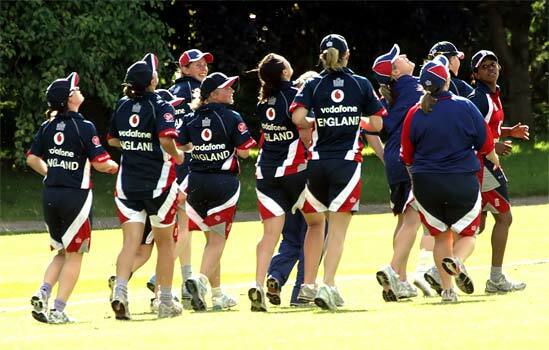 It seems to me that this is the area of cricket where women are least able to compete with the men's game. 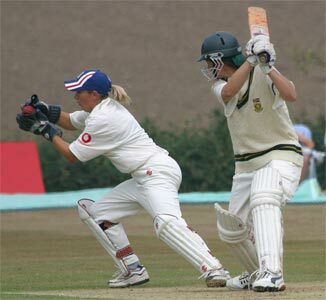 I am often asked by those who doubt women can play the game at any level worth watching "How many 6s do they hit?" and "How fast do they bowl?". These are the attributes which spectators not naturally of a cricket watching persuasion i.e. those who are more likely to turn up at T20 matches, are most taken by, and those which women's cricket is least likely to deliver. It seems to me that it is in the longer versions of the game where the attributes required to be successful more nearly meet. Finances will not permit Test matches to be played on more than the odd occasion, so ODIs would seem to be the ideal compromise. Now don't "get me wrong" here. I find the women's T20 well worth a watch and no doubt some locals would come from time to time from pure curiosity. Better by far surely to play these matches - when you can - in juxtaposition with a men's game. That way (as recently at the MCG) the crowd get a flavour of what the game can offer and maybe turn up to longer versions, where, in my opinion they will get a better idea of what the players can do than in a crash bang few overs with probably few 6s and what they would think of as medium pace bowling. I suggest this course only because it isn't physically possible to play two 50 over matches end to end in one day so T20 is the only way you can accomplish this. It is unfortunate it won't, in my view, show the sport at its best! I particular enjoyed Bath CC's effort last year when, if you took the trouble to turn up in the morning, other games or activities were on offer. If there isn't a men's feature on which to ride piggy-back then Bath had the solution worked out to perfection!! I am delighted to discover I won't be visiting them only for club cricket this coming summer. Most encouraging must be Steph Davies' debut figures of 4-47. It looks as if England have yet another all-rounder to consider in the future. And as Steph joins another player departs. Jane Smit's leaving has caused all sorts of speculation among the media about the manner of her going. I would rate this as rather more than unfortunate since Jane has had one of the longest and most successful international careers for any country in the last couple of decades and this has become somewhat over shadowed. There was a time, until the latest keeper arrived in the squad, when it was quite impossible to think of anyone else behind the stumps in an England shirt. Indeed I can remember typing years ago that after writing five or so names on a piece of paper it was hard to work out the remaining nine. Jane would undoubtedly have been one of the five. 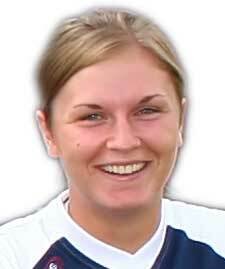 She appeared for England 130 times in ODIs and Tests and made more than 150 dismissals. It's hard to believe those figures will be bettered for many, many years. While she never made a century (highest score 91 in an ODI) it is for her work with the gloves that she'll be best recalled. The press have suggested that the retirement is from international cricket and I have to hope that is accurate and the next time Sussex play Nottinghamshire I hope to watch that glove work again. I, for one, regret that press chatter has clouded her announcement of retirement. Her reasons are her own and deserve to stay that way. Her career should to be remembered for its skill and longevity. It remains to be seen if other keepers around can match her stats and her stamina. They'll have a lot of work on their hands to come close.